The Club started in 1934 on a barge at the junction of the Illinois and Fox River. It was formed by a group of local boaters to promote the idea of boating in the area. The Club outgrew its barge location and moved to land just east of the Hilliard Bridge. The original land location was a small building built on City owned land. It was expanded over the years by adding on several additional rooms to accommodate its growing membership. 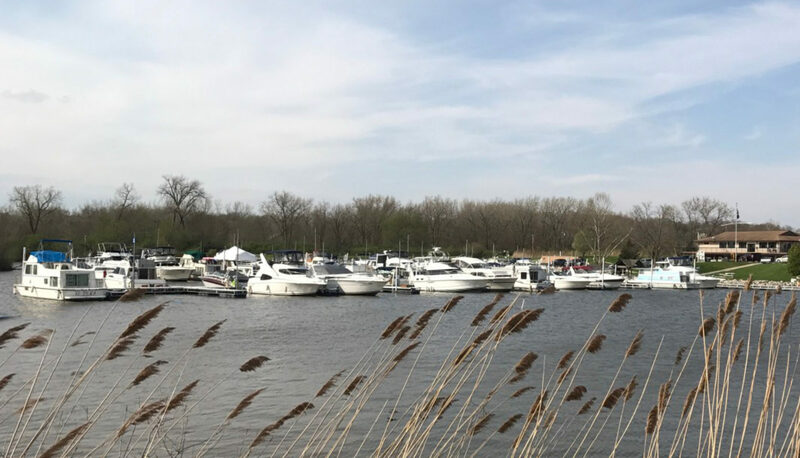 The Club maintained docks on the west side of the Fox River and on the north shore of the Illinois River. Later it leased the cast bank of the Fox River, which was cleared and filled to create the present land area. Dockage was installed on this side to satisfy the members’ increasing need for larger docking space. For many years the Club organized an annual Labor Day Party which was a major function hosted for the Lake Michigan Yachting Association. Bulls Island, containing a swimming area, was leased by the Club for many years and used for a number of social and membership functions until it was sold in the mid-1980’s. The present bridge replaced the old Hilliard Bridge and the club building had to be vacated in 1981. The entire west side dockage area was relocated to the east side of the Fox River and the Odd Fellows hall on Court and Main St. was used for meeting and parties. When the new bridge was finished, a site just west of the bridge was leased from the City for the construction of a new clubhouse together with dockage on the west side of the Fox River. This building was completed in late 1987 and was in operation until October 1988. The City lease was canceled by a court order and the clubhouse was moved to a barge. The dockage area was also lost. The old building foundation is still used by the City as a reviewing stand for river activities. The Club continued to operate for several years at the former “Down Under” lounge at the SW corner of Main and LaSalle streets while looking for a new location with dockage. The present site was purchased in November 1991 and cleared in early 1992. The building was moved from the barge to its current location later that year. The clubhouse opened for operation in October 1992 with a fine view of the Illinois River and our “name-sake” Starved Rock State Park to the south. The site is being developed, the harbor has been dredged and docks installed. The building is being completed and on-going improvements continue to be made by the membership. The Club has gone “full-circle” from its original start on a barge to land to barge and back to land but with one big difference. We now own the land, and are in control of our own destiny. The Club’s 80th anniversary was celebrated in August, 2014.